Hadar Goldin's mother says it is a basic humanitarian value to have the return of her son's body included in an agreement with Turkey. Leah Goldin, mother of IDF soldier Hadar Goldin whose body is being held by Hamas in Gaza, on Monday expressed the family’s disappointment over the fact that Israel’s reconciliation agreement with Turkey did not include the return of her son’s body. “I was told that Hadar was the victim of a ceasefire rather than the victim of a war,” she told Arutz Sheva, in reference to the fact that her son was killed when a ceasefire had already been in effect. The families of the missing soldiers have been in contact with Prime Minister Binyamin Netanyahu and other officials for two years, she continued. “He promised to both families separately that any negotiations in the region will include the return of Hadar and Oron as a precondition,” said Goldin. “We believe in a good agreement. We want this agreement to happen because this is our opportunity to bring back our son for proper burial in Israel. This is the basic humanitarian value in each religion. This should be a crucial part of any deal,” she stressed. 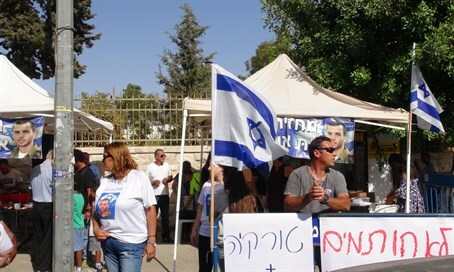 The families have been meeting with Knesset members and are hoping they will be able to convince the Prime Minister to update the agreement with Turkey so that it includes the return of the bodies of Hadar and Oron. “The fact that Hadar and Oron are not in the agreement is bad for the people of Israel and for the IDF soldiers who are not taken care of and not supported. What will be in the next war?” she said.